Among the provisions of that restructuring plan is a proposal to combine the Departments of Education and Labor. That aspect of the proposal accounts for 4 of the document’s 132 pages. 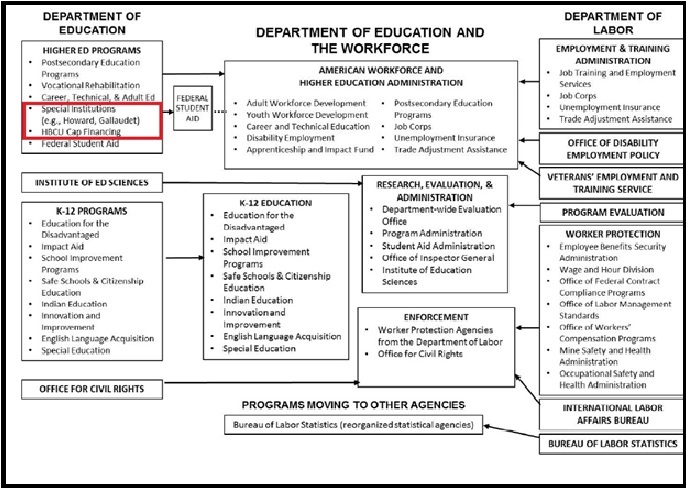 No meaningful level of detail about the new Department of Education and the Workforce is provided, though a very broad overview is available. In general, most of the Higher Education programs from the Department of Education and the Employment & Training Administration programs would be combined under the Department of Education and the Workforce’s American Workforce and Higher Education Administration. Federal Student Aid would operate as a separate program. This combination would likely make it easier for the federal government to cut some of the programs whether or not synergies are achieved. Two Higher Education programs are conspicuously absent: HBCU (Historically Black Colleges and Univerisities) capital funding and Special Institutions (e.g., Howard, Galludet Universities). The HBCU Capital Financing program provides the nation’s HBCU’s with low-cost capital to finance capital improvements. The program has $1.1 billion in budget authority to make loans to the HBCUs for repairs, renovation, and construction of campus facilities. Both Howard and Galludet Universities are federally-chartered institutions. They receive a majority of their funding from the federal government. It is uncertain whether federal funding for these schools would be eliminated or phased out with those institutions being required to change their charter status. Political prospects for the adoption of the Department of Education-Department of Labor combination are low. First, the plan as introduced lacks the kind of detail necessary for immediate consideration by Congress; Second, Congress would be need to develop the details to convert what is a broad sketch into legislation, even as the mid-term election is approaching. Third, Congress remains politically polarized. It is extremely unlikely that consensus could be developed to craft the proposal into legislation and then to pass the legislation. Congress has already had difficulty reauthorizing the less contentious Higher Education Act, which has been extended since 2013. All said, no near-term changes in the status of either the Department of Education or Department of Labor are likely. This entry was posted in Higher Education and tagged Department of Education, Department of Labor, HBCUs, higher education, plan, reorganization, Trump Administration on June 25, 2018 by Don Sutherland.